Amy's Creative Pursuits: A Skirt To Hike In? In my last travel post, I got a little more personal than I usually do on my blog and shared that my husband and I have been enjoying our Sunday afternoons exploring our own hometown. The Sunday I wore this outfit, we went to church in the morning then we took a short hike in Mt. Simon park. Now most women wouldn't wear a skirt hiking, but it was a very short hike from the parking lot to the overlook. Plus, as I already stated, we went to church in the morning so I had to wear something appropriate for church too. I actually prefer wearing shorts skirts over shorts in the summer. I find them so much more comfortable and stylish. Because I knew I would be hiking, I chose very comfortable walking sandals from Younkers. They are very supportive and have a great sole for gripping. I also wore a sun hat for sun protection. I always wear a hat now if I know I'll be outside for extended period. I chose a cross body bag for ease to carry. My sandals are by Relativity. If you're looking for a sandal that you can walk long distances in...this is it! I bought these to wear on my Myrtle Beach vacation last spring, and I walked miles in them with no pain! 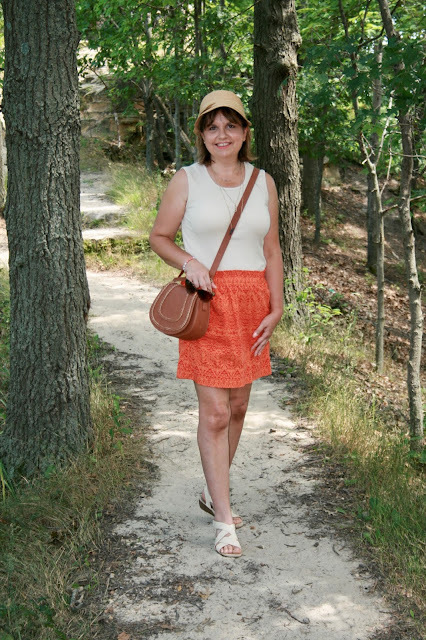 My cross body saddle bag was a gift from my daughter and so was the bracelet I have on. I chose brown tortoise shell sunglasses to coordinate with my outfit. I found this sun hat from JCPenney this summer (sorry, but it's no longer available). 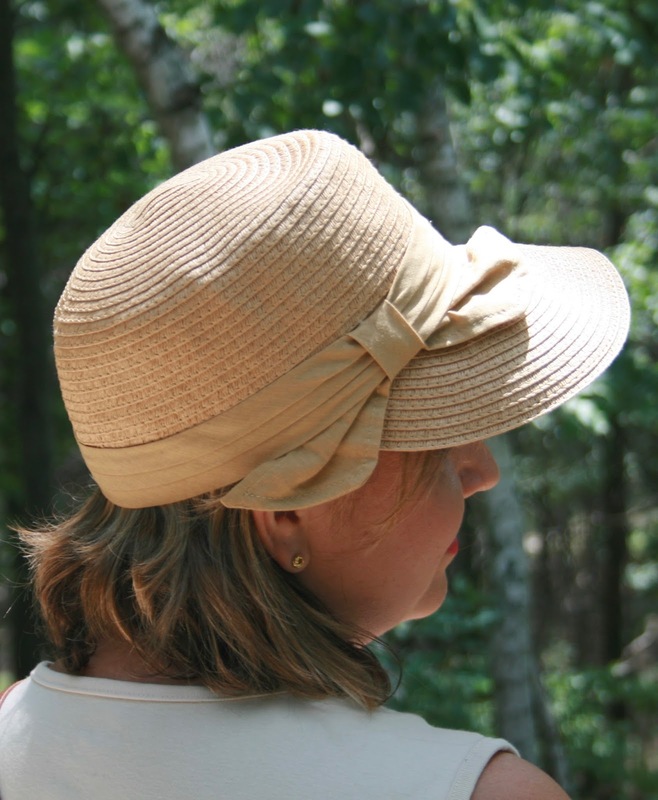 I absolutely love it and it has become my go-to hat this summer. I like the baseball hat style with the straw hat flair! The ribbon is so cute, and the front brim is so big it really keeps the sun off my face and out of my eyes. My triple strand stone necklace is from Express (old). My top is just a simple beige sleeveless top from Walmart. I bought it at the end of last summer when they had a summer clothes clearance sale. l got this top plus two more in other colors for $2.00 each and then I also picked up three pairs of shorts for $3.00 each! I don't normally buy clothes at Walmart, but at those prices how could I resist? My skirt is super old. I have shown it to you many times before HERE, HERE, and HERE. It is by Joe Fresh. It was such a pretty day for a walk in the woods. We've been having such mild temperatures for the month of August: it's mostly been in the 70's or low 80's. It's not great if you want to go swimming, but it's awesome for all other outdoor activities like hiking or gardening! And here is the view we were looking for! It overlooks the Chippewa River and downtown Eau Claire. We live in such a pretty area! That hat is so cute, I really love it! I need to be better about wearing hats outside, but I do always wear SPF! This outfit def. works for church and a simple hike and its adorable on you! I love the bright color of the skirt. I think its good to have some sandals in the summer that are comfortable, since sometimes you want to look cute even if you'll be doing a lot of walking. I love the skirt, such a pretty color too! I don't wear skirts much anymore, mainly because I have a hard time choosing what shirt to wear with a skirt. The view is gorgeous, you do live in a beautiful area! Thanks Elli! I don't think choosing a shirt to wear with a skirt is any different that choosing a shirt to wear with shorts. Unless it's denim shorts, because just about anything goes with denim. Great summer-fresh look. You have the legs for short skirts so it's great that you're not wasting the opportunity, despite having experienced a summer similar to ours. I'm missing the swimming though. You really do live in a pretty area and I love your idea of Sunday Fundays, it's so easy to get swallowed up in day to day and not stop to enjoy the beauty around us. X.
I love that you went out and about hiking in a skirt!! At least when we go "hiking" it's still in suburbia and not like the jungles, so it's perfect!! Could I link to this post in my post to go out next week?? Thanks Jodie! Yes, absolutely, you can link to my post. Thanks so much! I'm glad you showed us your neighborhood countryside. It looks so scenic. Looks a lovely day for the hike. I tend to cover my legs unless I'm on vacation and then it's shorts for me nowadays. You certainly have the legs for that skirt. Keep wearing it . Thank you! I'm grateful to live in such a beautiful area. You sure live in a beautiful place! I very much like your outfit and that it works so well for multiple occasions! Thanks Andrea! It is pretty here, but your the lucky one living so close to the ocean! Such a cute look, Amy! I agree with you when it comes to wearing a skirt over shorts. Definitely more comfortable and it just elevates your whole look. This is such a sweet look! I especially love that hat and skirt! 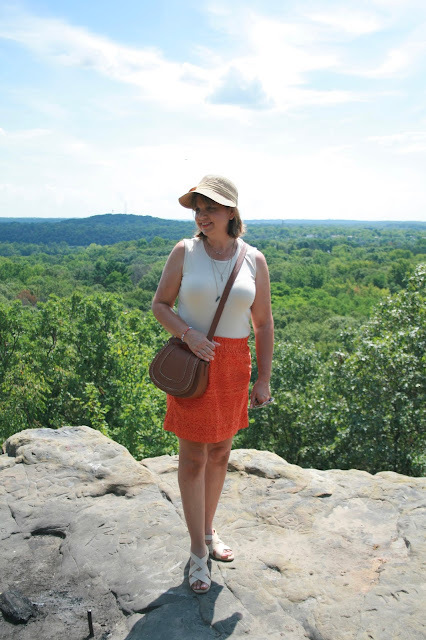 Thanks for joining the Top of the World Style linkup party with your post. You looks so cute and young in this outfit. It's amazing! You really rock this look! Aww, thanks Nicole! Your so sweet!